La Ventana (16A Dempsey Road, tel: 6479-0100) by famous Catalan chef Carles Gaig, opened without fanfare recently. More people are getting to know about it, and that is a good thing, since the food is great for the most part. At lunch recently, I had the Gran Apat Tasting Menu ($148++ a person, minimum two people), a sort of whiz though the menu highlights. It sounds expensive, but it was a solid meal of many more hits than misses. Among the tapas that we sampled, the Jamon Iberico de Bellota was a standout. The bread rubbed with tomato was thin and ever so crisp, and draped over it were slices of Joselito jamon, one of my favourite brands. Lobster Coca, puff pastry topped with eggplant puree and roast bell peppers in pretty stripes and then chunks of lobster, was a luxurious snack. A house speciality, Canelon since 1869, is a recipe from the chef's family. 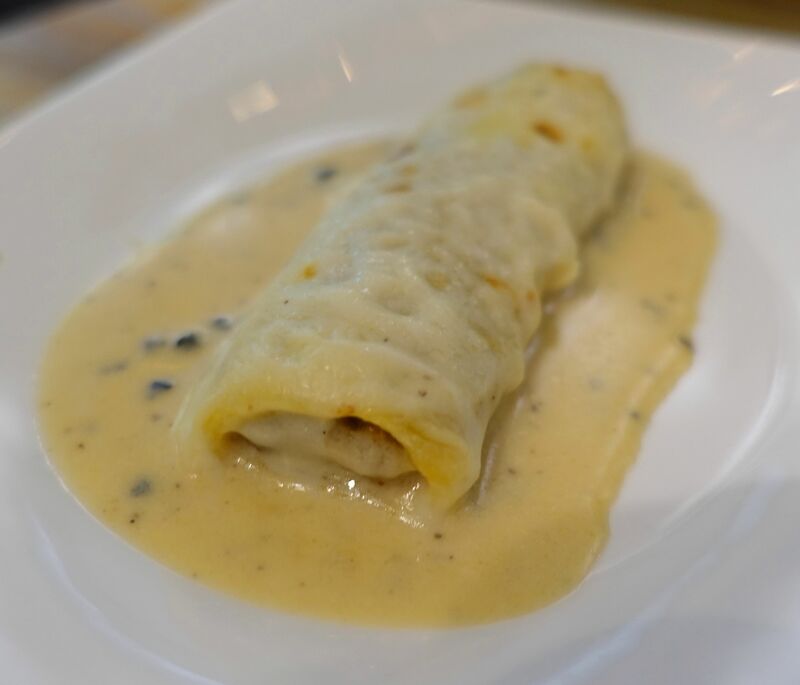 The cannelloni (left) is stuffed with foie gras, pork and beef, and blanketed with truffle cream sauce. It's a small portion and rich in a good, no-truffle-oil way. 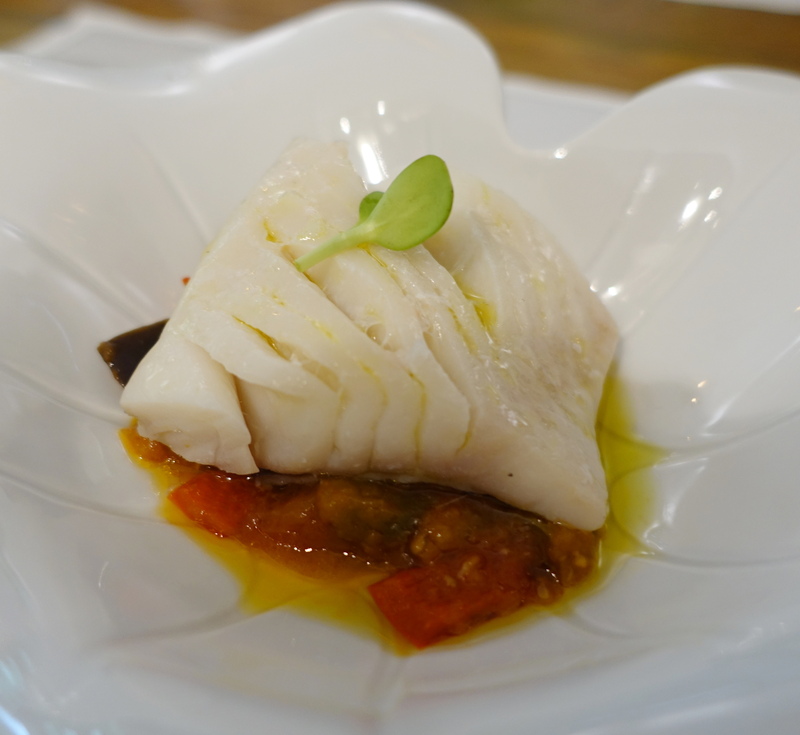 My favourite dish in the meal is the Black Cod & Samfaina (above), slow-cooked bacalao on a vegetable ragout. The fish was cooked perfectly and the moist flakes were truly a joy to eat. The restaurant is filled with natural light at lunch time and surrounded by greenery. If you need an escape at lunch time, this is it. This new food festival, which debuted this year, has brought some interesting chefs to Singapore. Last month, Nick Bril from The Jane in Antwerp was here to cook. I missed that, alas, and hope he'll be coming back here soon. 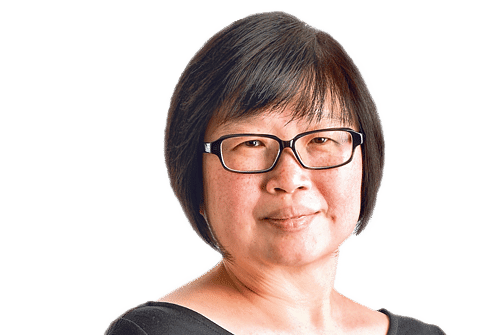 The year-long programme by Citibank features one edgy, cutting edge chef a month, who collaborates with chefs from two Singapore restaurants to produce two six-course meals. Citibank cardholders pay $100++, while others pay $180++. I managed to get my act together and book a meal by this month's chef: Luke Burgess. The Australian used to head Garagistes, a restaurant in Hobart which serves beautiful plates made with great Tasmanian produce. He and his business partners have sold the restaurant and he is back in Sydney, doing some cooking gigs before travelling. At Opus Bar & Grill at Hilton Singapore, I had a great meal by him and Opus chef Rene Knudsen. They created two dishes each and collaborated on the remaining two. It was seamless. Knudsen's toothfish was terrific and the accompanying scallop was velvety and raw in the middle, as it should be. Shaved Lily Bulb & Salted Green Radish was a great contribution by Burgess, using ingredients that are familiar to Chinese cooking in a very different - and delicious - way. The sweet Alaskan snow crab meat in the dish was not overwhelmed by the black pepper sauce. In these days of sous vide cooking, I miss meat cooked totally on the grill. The texture is so much better than when it is cooked sous vide. There is chew, there is spring. 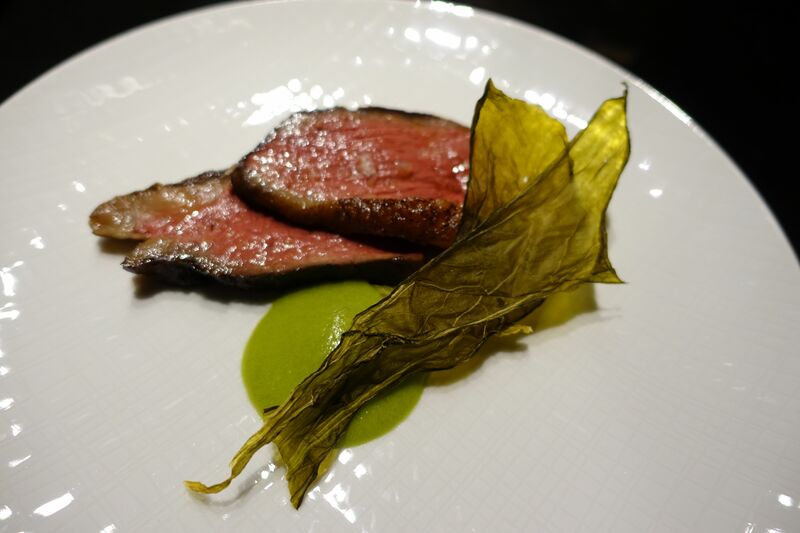 Burgess' Darling Downs Wagyu Rump Cap (above) is not the most tender cut of meat but it has plenty of flavour. And the accompanying sauces, black garlic and creamed lettuce hearts, were good accompaniments. So was the fermented Chinese mustard, an ang moh version of kiam chye, if you will. As long as they keep bringing in interesting chefs, I think the programme will have great lasting power. After three years, the partners behind Immigrants Gastrobar (467 Joo Chiat Road, tel: 8511-7322) are closing the restaurant. What a pity. The place was a great showcase for chef Damian D'Silva's cooking, which shows the richness of Singapore's food culture and history. He cooks dishes that are too labour intensive for other restaurants to want to do. I have enjoyed Singgang, an Eurasian dish of deboned wolf herring cooked with ground spices and a little coconut milk; Seh Bak, a dish of pig offal simmered in soya sauce and spices; and Babi Assam, belly pork simmered in tamarind and spices. His Kueh Bengkah is old school and beautiful. The last meal at the restaurant will be served on Aug 31, and some of the restaurant's signatures will be served buffet style at $50 a person, with a minimum of 10 to dine. If you can rustle up enough people, do go. 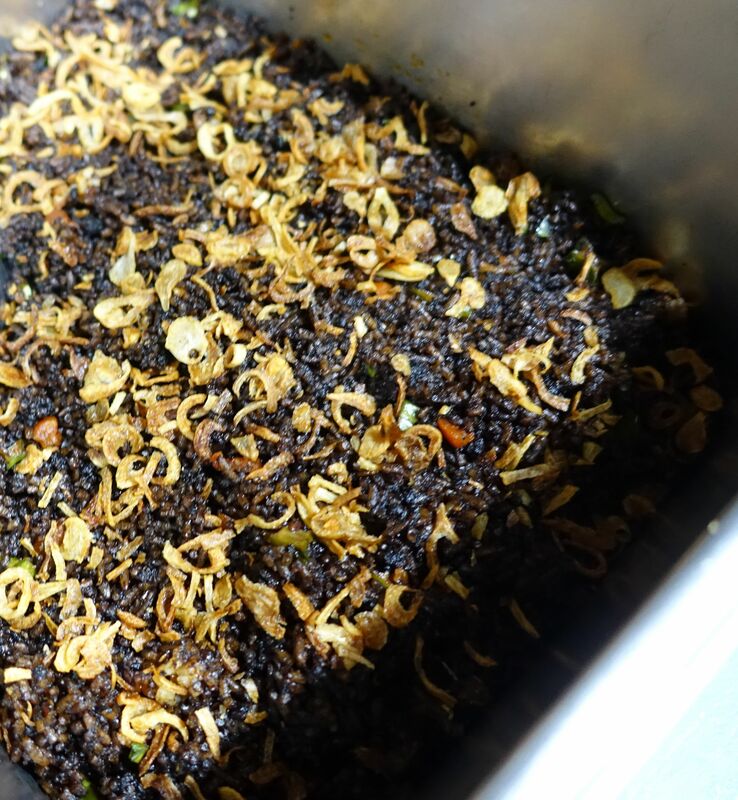 One of my favourite dishes on the menu is Buah Keluak Fried Rice (pictured above), made with the black, loamy paste from the pungent Indonesian nut, and spices. I wonder, how will I get my fix of this from now? Other restaurants offer it, of course. But no one does it quite like chef D'Silva. Tucked away in Sembawang is a restaurant that not many people know about. Those in the know, however, go back time and again for its unusual dishes, all of them done very well. Recently, a big group of us celebrated a friend's promotion with an epic dinner at The Famous Kitchen (54 Sembawang Road, tel: 6257-1843). Chilled cockles topped with fiery chillies and garlic, and salted egg yolk squid were among the delights. However, two dishes stood out for me: Crystal Chicken ($36, above) and sliced belly pork topped with crisp garlic (from $15, left). The chicken looks plain but the restaurant uses kampong chicken so the meat is anything but bland. Scoop the juices on the bottom of the plate and spoon it over rice. It is swoon-worthy. 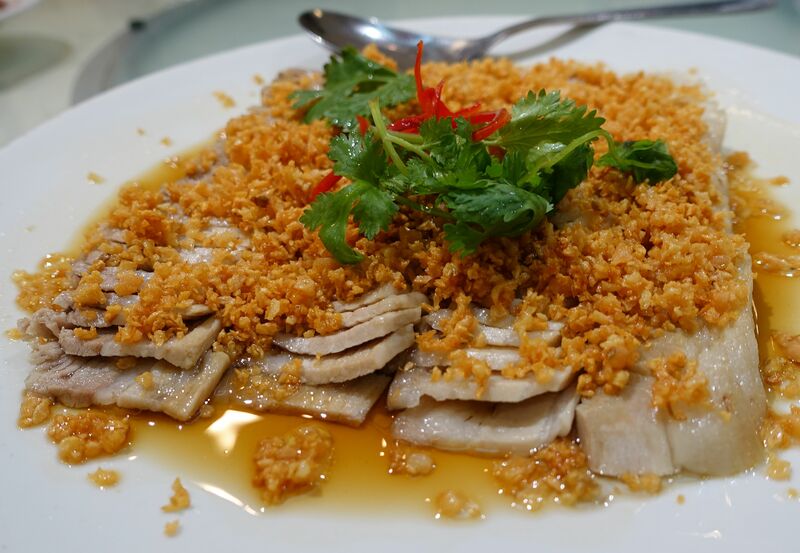 Order the pork dish at least a day in advance. The restaurant uses fresh pork, not chilled or frozen. That accounts for how springy the thin slices are. There is no trace of bitterness in the golden brown bits of garlic on top either. Every time I need a Thai food fix, I head to Golden Mile Complex. There is the added attraction of the Thai supermarket on the second floor, where I can load up on fish sauce and other condiments, and herbs. But for a long time now, I have been going to NongKhai Beer Garden on the ground floor. Recently, I sought out another restaurant tucked away behind a row of shops, BeerThai House Restaurant (01-94/96 Golden Mile Complex, tel: 6291-2267). While I like the food at NongKhai, I love the food at BeerThai. 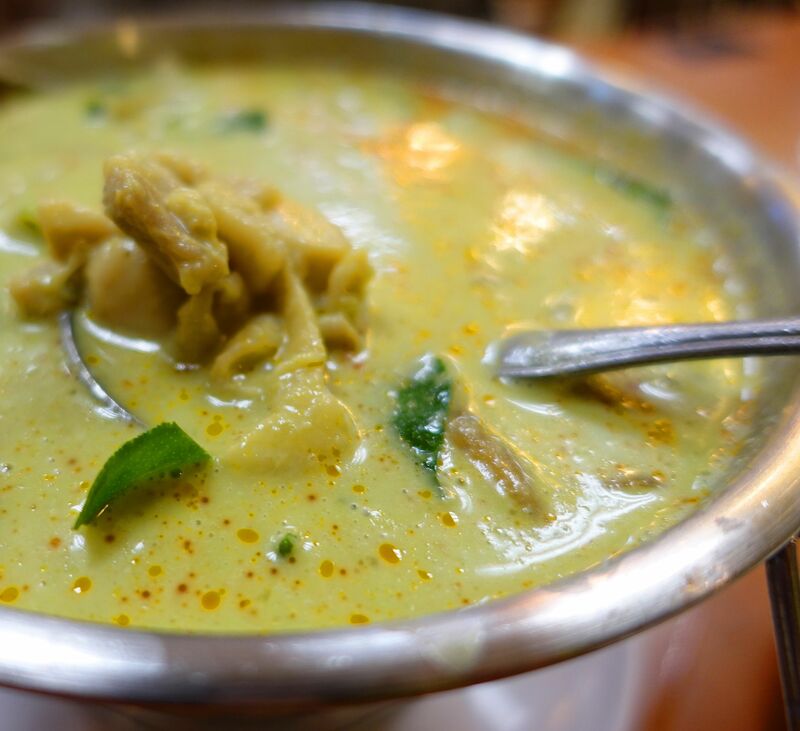 It is robust and authentic, full of punchy flavours that make me sweat and want more. The cloudy Tom Yum soup ($10) is a bit too spicy for me but it woke me up nicely that Saturday. 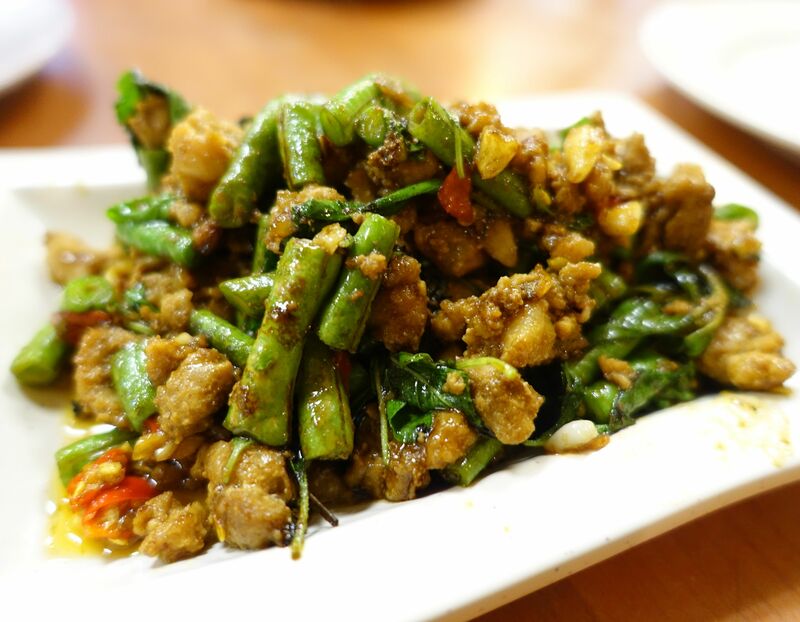 Minced pork stirfried with basil and green beans ($10, left) is perfect with rice. It usually comes with bamboo shoots but unless you like the stinky version of the shoot that the restaurant uses, it's best to ask the cooks to leave it out. My big discovery was in the rather ordinary looking chicken in green curry ($10, above). 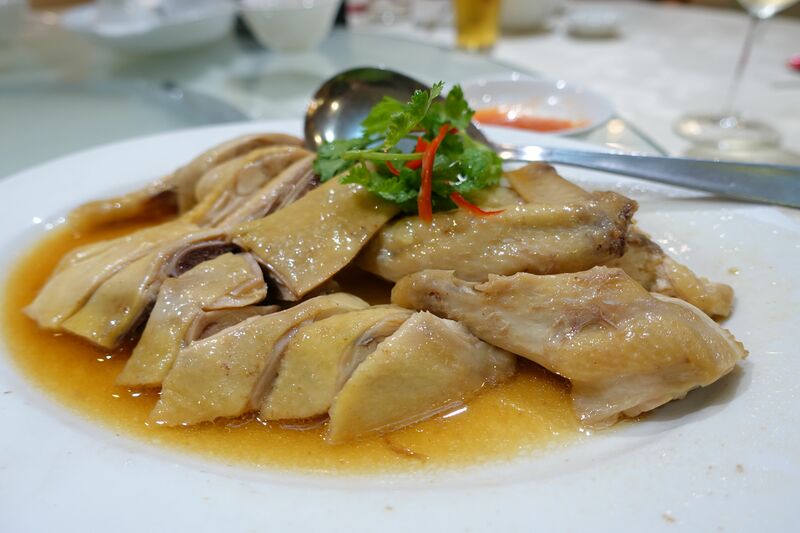 It looks like many versions served in many restaurants, a serene pool of light green with chicken and kaffir lime leaves lurking below the surface. But I bit into something so insanely aromatic I was just startled. Then I started digging into the serving pot to find more. Mom had a taste and was similarly enchanted. We asked the staff what it was and they showed us pictures of krachai or finger root, a herb which resembles, well, fingers. It tastes like a cross between green mango and young ginger, which, you must admit, is pretty exotic. It is known to soothe the stomach. I went upstairs to the supermarket after lunch and bought a packet. I must find interesting ways to use it.